Delivered the old fashioned way! For the heart of your home! Hearthstone Heating and Air Conditioning, Ltd. has achieved the complaint-free A+ rating for over a decade. We never rely on subcontractors to do our work or live up to your expectations. By partnering with Comfort24-7, Hearthstone Heating and Air Conditioning, Ltd. is able to offer a Two-year 100% Money Back Satisfaction Guarantee on new system installations. 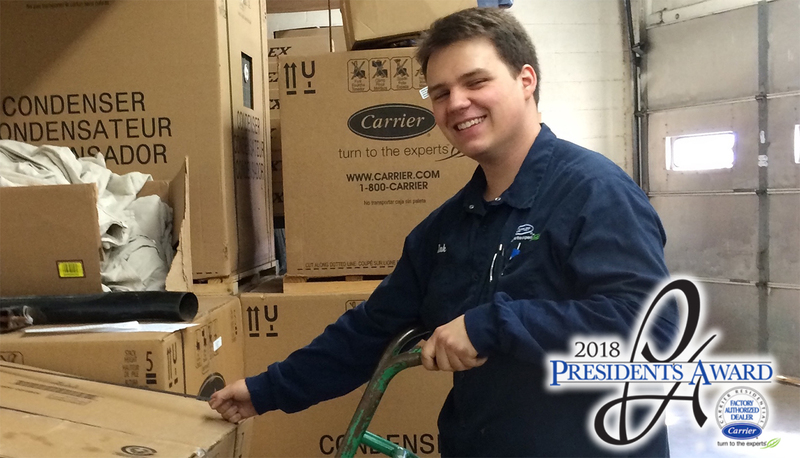 By exceeding expectations in customer service, management, business growth and operational excellence, Hearthstone Heating and Air Conditioning, Ltd. is proud to have been recognized with Carrier President’s Award. Our certified technicians have verified their understanding of today's increasingly complex heating and cooling systems by passing nationally recognized exams developed and endorsed by all segments of the HVAC industry. The Western Suburbs's Best AC Service! Whether you need routine maintenance, emergency repair, replacement equipment, or a complete system, call us today. We’re the people you can count on for all your family’s home comfort needs. We proudly service all of DuPage County and its surrounding areas including: Downers Grove, Darien, Lisle, Clarendon Hills, Hinsdale, Oak Brook, Burr Ridge, Woodridge, Naperville, Bolingbrook, Lombard, Elmhurst, Western Springs, LaGrange, & more! A new high efficiency HVAC system! Since 1996, Hearthstone Heating and Air Conditioning, Ltd. has dedicated our extensive resources, training and conscientious service to home and commercial comfort in DuPage County and the surrounding areas. Through hard work, customer focus, and the highest efficiency products, we ensure that you have the best possible experience from the moment you call us to the completion of all work. Over nearly twenty years in business, we’ve learned exactly what it takes keep a home comfortable, despite the extreme weather swings, and promote only those products that provide outstanding efficiency, reliability, and performance to guarantee our customers comfort and satisfaction. 24-hour emergency HVAC service, 7 days a week! We recognize that some of the most difficult heating and cooling problems you face as a home or business owners aren’t restricted to normal business hours. For those desperate times, Hearthstone Heating and Air Conditioning, Ltd. offers 24-hour, 7-days-a-week emergency service. Know that when you call 630-435-9800, help is just minutes away. Our offices are located at 105 W 61st Street, Westmont, and we pride ourselves on prompt and personalized attention, striving to combine old-fashioned values with modern expertise. 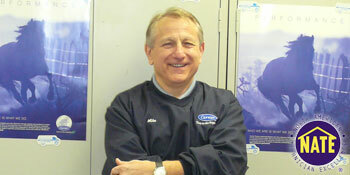 We service all makes & models of heating and cooling systems! Hearthstone Heating and Air Conditioning, Ltd. is a Carrier Factory Authorized Dealer, having earned the distinction by performing to rigorous national standards, and participating in extensive factory training specific to equipment installation, maintenance and repair. Through our Carrier Factory endorsement, we install the heating and cooling products that set the standard for others to follow. 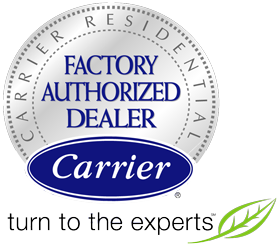 Since Willis Carrier invented modern air conditioning over one hundred years ago, Carrier has consistently ranked among the world’s best, leading the field in design, innovations and overall performance. Hearthstone Heating and Air Conditioning, Ltd. partners top-of-the-line equipment with the most highly trained and dedicated service team. Our comfort specialists are all NATE-certified (North American Technician Excellence), a guarantee of quality heating, ventilation and air conditioning performance. Our staff is BPI certified. The Building Performance Institute, Inc. establishes national standards and worker credentials based on the purpose of improving comfort, efficiency and safety by optimizing the relationship between your home and your temperature control systems. The Hearthstone Heating and Air Conditioning, Ltd. technicians have verified their knowledge and skills in building science solutions, and will evaluate your residence or facility to identify concerns with air quality, utility costs and comfort. Energy-Efficient Furnace Service & Air Conditioner Service in Naperville, Westmont, Downers Grove, and surrounding areas. In an ongoing effort to safeguard the environment and maximize the value of your energy dollar, Hearthstone Heating and Air Conditioning, Ltd. promotes a wide range of high-efficiency heating and cooling, ENERGY STAR rated options. ENERGY STAR products meet exceptionally high standards of energy efficiency set by the US Environmental Protection Agency. By upgrading to ENERGY STAR qualified products, you’ll not only save money on utility bills but also enhance the comfort of your home and protect our climate by reducing greenhouse gasses. We are extremely proud of our Better Business Bureau A+ rating. Better Business Bureau letter grades are based on the number of complaints filed, business practices, customer service, time in business, and required licenses. To ensure stress-free and affordable temperature control, whether you’re hoping to install or upgrade, are in need of repairs or maintenance, Hearthstone Heating and Air Conditioning, Ltd. offers a variety of helpful incentives and options. Flat rate billing, free estimates, rebates and flexible financing at low monthly rates are available to expedite your rewards from a high-efficiency, reliable comfort system. We also accept Master Card, Visa and Discover. Contact us from heating & A/C in Naperville, Lisle, Downers Grove, Woodridge, Darien & Westmont, IL! When you contact Hearthstone Heating and Air Conditioning, Ltd. at 630-435-9800, you can count on the highest quality service. Find us on Facebook, Twitter, YouTube, BlogSpot, Foursquare and Yelp. Proudly serving Naperville, Lisle, Downers Grove, Woodridge, Darien, Westmont, IL.